QASH (pronounced „cash“) is the universal native token of the LIQUID platform. QASH is the fuel that will power all services provided by the LIQUID platform and the QUOINE’s (pronounced „coin“) existing platforms (QUOINEX and QRYPTOS). QUOINE is a successful and profitable crypto company with excellent reputation and financial industry pedigree. They are the first global cryptocurrency firm in the world to be officially licensed by the Japan FSA. The team at QUOINE has identified a single fundamental problem for users of crypto markets that is of the highest importance for the health and growth of the crypto economy. That problem is the liquidity. Liquidity is the heart of any economy and industry or even individual business. By the definition, liquidity describes the degree to which an asset or cryptocurrency can be quickly bought or sold in the market without affecting the asset’s price. Also, liquidity refers to the extent to which a market, such as a crypto market or a foreign exchange market, allows assets to be bought and sold at stable prices. This means that if you are an owner of crypto asset that has low liquidity, you are in a serious trouble. With their latest developments, people at QUOINE believe that they can become a liquidity provider for crypto assets as many great banks are for traditional finance assets such as Goldman Sachs, JP Morgan Chase, Deutsche Bank, Citibank and Bank of America. The QUOINE Liquid Platform is built to provide liquidity to the non-liquid crypto economy, a single globally-sourced trading platform (World Book) with an associated suite of services (Prime Brokerage) which will enable the highest level of liquidity. In the process, this will allow anybody to tap into all the opportunities the new crypto economy has to offer. At the moment, the total available liquidity for crypto assets is divided among different exchanges. Most popular crypto exchanges offer different crypto assets but none of them dominates in any one crypto asset. Additionally, liquidity and the best price for a given trading pair changes from one exchange to another. At one point, the best would be to buy BTC in US, while just an hour later it could be Asia or Europe. 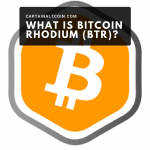 It is valid for other cryptocurrencies as well. We can look at the different crypto exchanges as Liquidity Silos. Every exchange is liquid in some trading pairs, but you can use only on that exchange. With access to all the major reputable exchanges worldwide, the LIQUID Platform provides an unparalleled and powerful suite of trading services to Individual and Institutional investors alike—as well as to Token Issuers and Token Holders. In order to provide single highly liquid tradable order book, Liquid platform combines orders from various liquidity sources, allowing orders to be placed in the currency of users’ choice. The World Book solves two issues: Liquidity Silos and Underserved Markets. At any time there is liquidity at one exchange in one currency pair such as BTC/USD and liquidity at another exchange in pair BTC/EUR. The issues are solved by connecting these exchanges into single point of liquidity and by allowing the order book to be priced in any of the major currencies and many minor currencies. External Aggregated Order Book – an order book that contains all other orders that are not placed in Internal Order Book. Every order in this book is linked to an order on the various exchanges internationally. Cross Currency Conversion Engine (CCCE) – it enables prompt currency conversions. When an execution is confirmed and the two parties don’t share the same Quote Currency, a Quote Currency conversion is necessary. 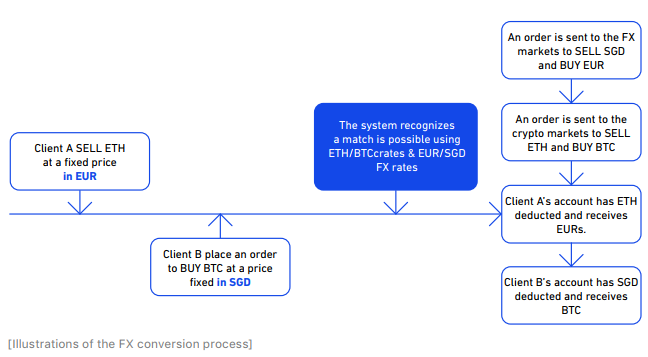 For example, if two clients of the World Book are both trading ETH (the Base Currency), but one of them is trading it in SGD and the other in USD, an FX conversion using USD/SGD must be added to the transaction to complete the match. This is automatically done by CCCE with real time adjustment of fiat and crypto exchange rates. 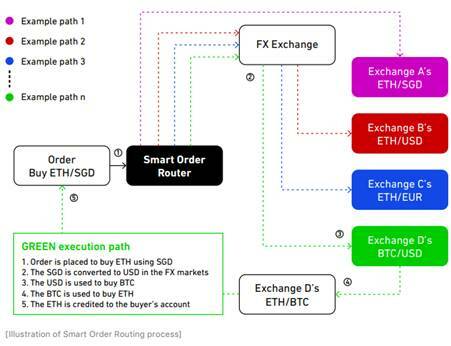 Smart Order Routing (SOR) – it enables real time feeds for all major exchanges in the world. If the order books changes, the Liquid platform adjusts World Book. If a user places an order on the World Book and there is no match internally, SOR seeks match on another exchange. 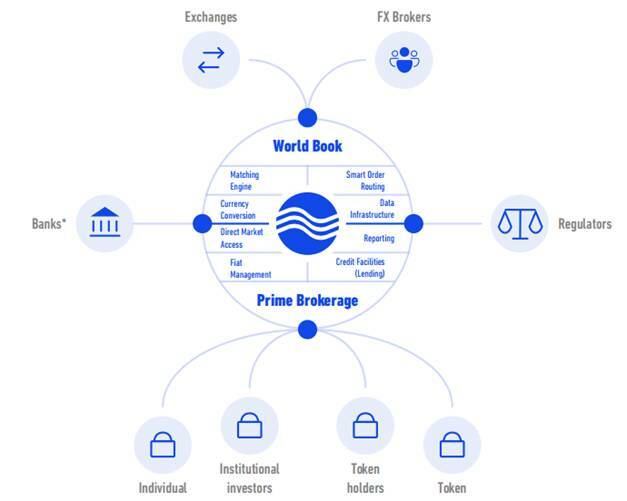 The Prime Brokerage is set of services to provide users with tools to reduce counterparty risk and increase their ROI. These services include Direct Market Access, Fiat Management and Credit Facility. It means that users can trade directly on any global reputable exchange without the need to open an account or funds on those exchanges. With these features, users are reducing counterparty risk as they are only dealing with QUOINE which is regulated by Japan’s FSA. It enables users to increase their capital efficiency as they do not need to move funds to other exchanges. It enables netting of positions taken across different trading exchanges. The token sale started on November 5th 2018 and ended on November 8th 2018, where 350,000,000 QASH tokens where distributed. Since the ICO, the price of token has changed 3.4x in USD, 1.14x in ETH and 2.28 BTC relative to the initial token price. 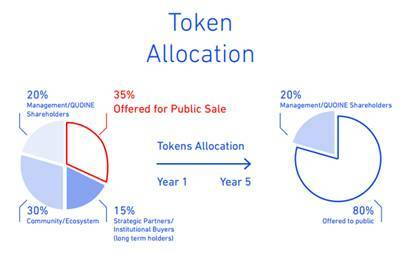 From total tokens of 1 billion, 35% were distributed during the Initial Coin offering, 20% of tokens were distributed to the Management and QUOINE Shareholders, 30% were distributed to community and 15% to strategic partners and institutional buyers. After the period of 5 years QUOINE will fully distribute the reserves and only retain 20% allocated to Management and QUOINE shareholders. Proceeds from the ICO will go into Liquidity (50%), Product Development (20%), Operations (15%) and Legal/ Regulations (15%). QASH is based on Ethereum’s ERC20 token standard. QUIONE is planning, by second quarter of 2019, to develop its own blockchain called QASH blockchain that will have specific requirements needed for financial industry. 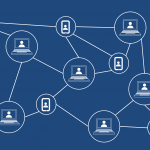 Current existing blockchains cannot offer significant and scalable financial services. The existing ERC20 token will be changed to the newly developed QASH token on the QASH blockchain. You can buy QASH directly on QUIONE platform QUIONEX but the liquidity is very low. Based on the latest information from CoinMarketCap, the highest volume can be found on Huobi with daily trading volume of just over $1 million for trading pair QASH/BTC. Please note, in order to buy QASH on Huobi, you will need to buy BTC or ETH and then transfer it. Since QASH is an ERC20 token, you can store it in any wallet that supports Ethereum blockchain, such as Ledger Nano S and Trezor. At the moment of writing, QASH’s market capitalization is just above $285 million with circulating supply of 350,000,000 tokens. The current price of token is $0.81693 with daily trading volume of just above $3.8 million. 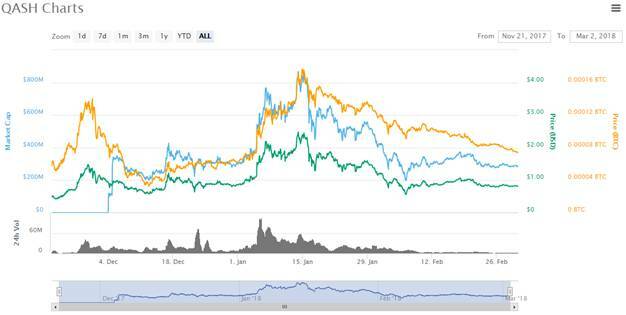 QASH recorded its all-time high price on January 15th 2018, when the price was $2.39 with the market capitalization of more than $838 million and daily trading volume of more than $44.5 million. The QUIONE’s team has a proven track record in Forex IT, Forex Trading, Algos, Equity Trading Systems, and FICC (Fixed Income, Currencies, and Commodities)—all combined with expertise in Internet and mobile technology. QUIONE was founded by Mike Kayamori (CEO) and Mario Gomez-Lozada (President and CTO) in 2014. Mike has over 22 years of experience in investments, business management, IT and venture capital across Japan, the United States, India and Southeast Asia. Prior to QUOINE, Mike was a Senior Vice President at SoftBank Group, managing its Asia operations and investments with SingTel and Bharti Group. He was also the CIO of Gungho Asia, the creator of Puzzle and Dragons. Before SoftBank, Mike was a Senior Director at Globespan Capital Partners, a Palo Alto-based venture capital fund with over USD1.2 billion under management. Mike holds a Bachelor of Law from the University of Tokyo and an MBA from Harvard Business School. Mario was the Japan CIO and Head of Fixed Income IT Asia at Credit Suisse (CS). At CS, Mario oversaw projects related to the expansion of the Fixed Income, Currencies and Commodities business in Asia. He was also responsible for creating the FICC Global Development Center in Singapore. As Japan CIO, he worked closely with local regulators and was responsible for IT Risk and Control. Prior to CS, Mario was CTO of Merrill Lynch in Japan, spanning a 13-year career where he was responsible for all aspects of the bank’s IT pertaining to the Fixed Income, Currencies and Commodities business. He was actively involved in early electronic trading initiatives, where he developed cutting-edge software for Sales and Trading systems. The goal of QUIONE is to make QASH to be the preferred payment token for financial services, like the Bitcoin for financial services. As more financial institutions, fintech startups and partners adopt QASH as a method of payment, the utility of QASH will scale, fueling the Fintech revolution. The platform is planned to be launched in the second quarter of 2018, with the highest level of liquidity in the world—allowing any individual to access the opportunities and wealth the new crypto economy offers. If the QUIONE’s team manages to solve liquidity problem it will be a massive achievement for this extremely experienced team and for the crypto economy in general.